River Plate's Ignacio Scocco celebrates after scoring one of his five goals against Wilstermann in the Copa Libertadores. There was no fairy tale, and no real tension. 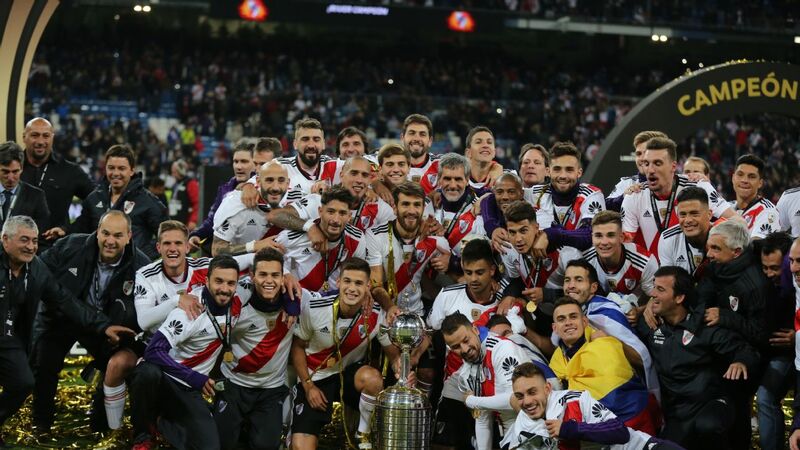 On a cold, drizzly night in Buenos Aires, the 3-0 first leg lead established last week by little Jorge Wilstermann of Bolivia slipped away against an irresistible River Plate, who coasted to an 8-0 thrashing thanks in no small part to five goals from Ignacio Scocco. 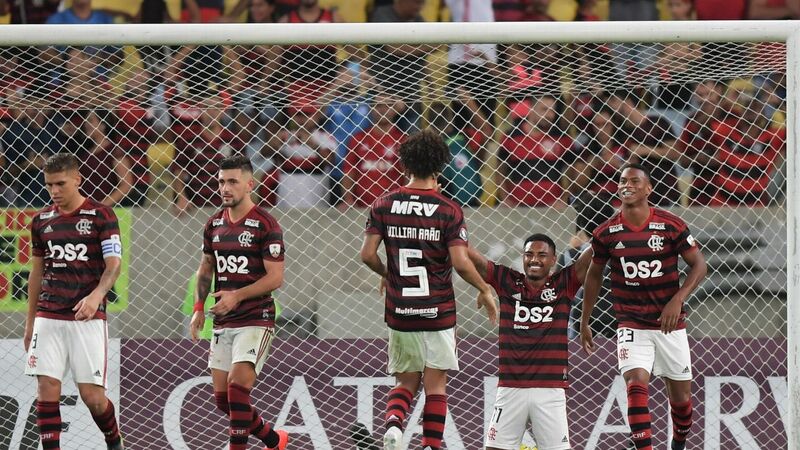 In the previous round, the Bolivians defended doggedly to secure a goalless draw and eliminate Atletico Mineiro of Brazil. Armed with their three-goal cushion, they had hopes of doing something similar in Argentina. River Plate had other ideas. River coach Marcelo Gallardo switched to a bold 3-4-2-1 formation, aiming to make the pitch as wide as possible. Wilstermann's Roberto Mosquera also changed formations, adding a third centre-back. It proved to be a disaster, leaving his team open through the middle and out wide because he had three men marking one -- or rather, not marking, because centre-forward Scocco wiped out the first leg lead with a hat trick inside the first 20 minutes en route to his final tally of five. The first one was always going to be the most important. How long would it take? And how would River find space to breach the packed Bolivian defence? The answer came when Wilstermann played a free kick long. 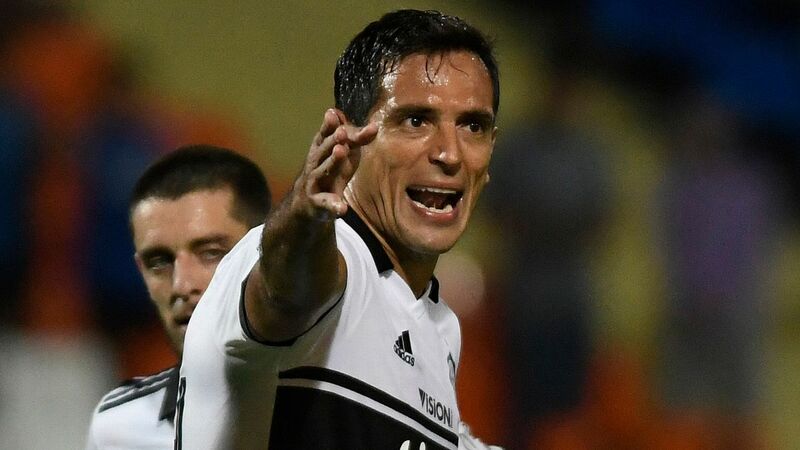 River quickly won possession, and Enzo Perez slid a rapid pass that caught the slow Bolivian defence high up the field and unable to deal with the pace of Scocco, who powered past Edward Zenteno, cut inside Enrique Diaz and keeper Raul Olivares and slotted home. Scocco had been guilty of missing some easy chances in the first leg. Now he made full amends. Wilstermann left-back Juan Aponte, one of the successes of their campaign, was off the field injured. River played into the vacant space wide on the right, Carlos Auzqui crossed to the far post, and Scocco cut onto his right foot and blasted a second. The third, after 18 minutes, came when he received a throw on from the left, turned right and hit a cross-turned-shot that dribbled inside the far post. Wilstermann were understandably shell shocked, and fell behind on aggregate before half time. This time Scocco turned provider, slipping a pass for a well-timed run and cool finish from the splendid Enzo Perez. The Bolivians, though, were still only a goal away from reaching the semifinals. A 4-1 defeat would take them through on the away goals rule. Could they use the interval to regroup and make a game of it after the restart? It took just 40 seconds to discover that they could not. With a delightful four-man move River tangoed their way through the left side of the Wilstermann defence and Scocco tapped in the goal that effectively ended the contest. River had time to add three more -- the highlight came when Perez charged all the way from the edge of his own area to score the final goal. 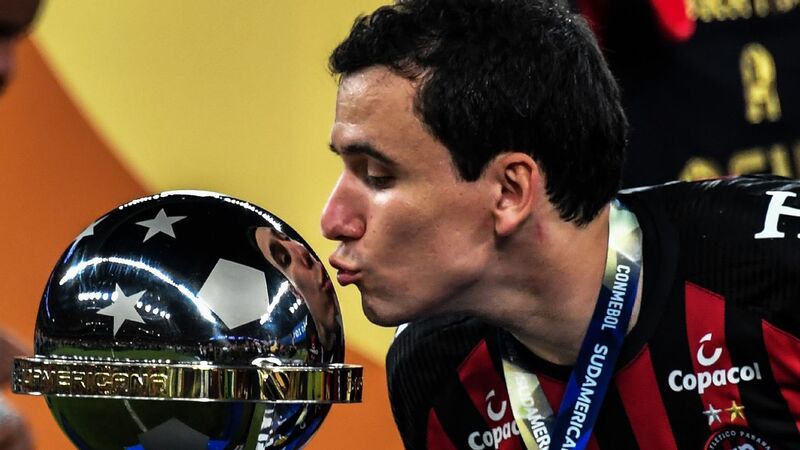 And Jorge Wilstermann, who had travelled down from Bolivia with such optimism, face a dispiriting trip back to Cochabamba as their hosts advance to the competition's semifinals. 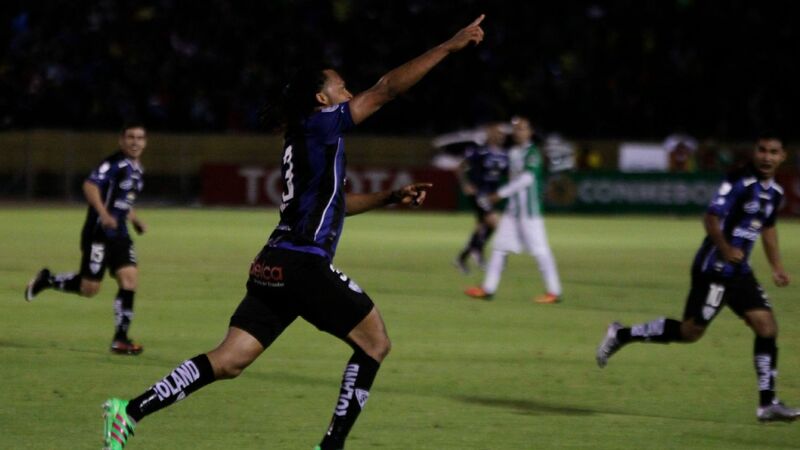 Jose Sand celebrates after opening the scoring for Lanus against San Lorenzo. A few miles south across Buenos Aires it was colder, wetter, but much tighter in the all Argentine clash between Lanus and San Lorenzo. 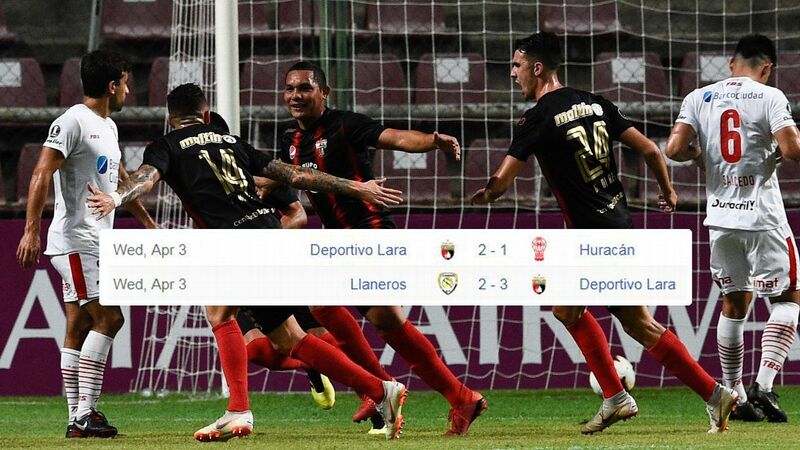 Just like the River-Wilstermann game, the home side, Lanus, came out chasing a deficit and quickly got themselves back on level terms on their way to a shootout victory. Lanus were two goals down after the first leg, but with their attacking 4-3-3 formation working with admirable fluidity, scored twice in the opening 15 minutes. Centre-forward Jose Sand broke the deadlock with a typically cute finish, and Nicolas Pasquini added a second with a looping header from a well worked corner routine. Sand then rattled the angle -- which appeared to awake San Lorenzo from their slumber. Having lost their advantage they were forced to play, and quickly found their attacking stride. Fernando Belluschi struck the bar with a superb first-time effort, and their 4-1-4-1 formation pushed Lanus back. San Lorenzo were rarely able to bring centre-forward Nicolas Blandi, last week's match winner, into the action, and though the second half pulsated from end to end, there were few clear chances. With aggregate scores level, the tie went to a shootout. Twice during the group phase San Lorenzo were minutes away from elimination. 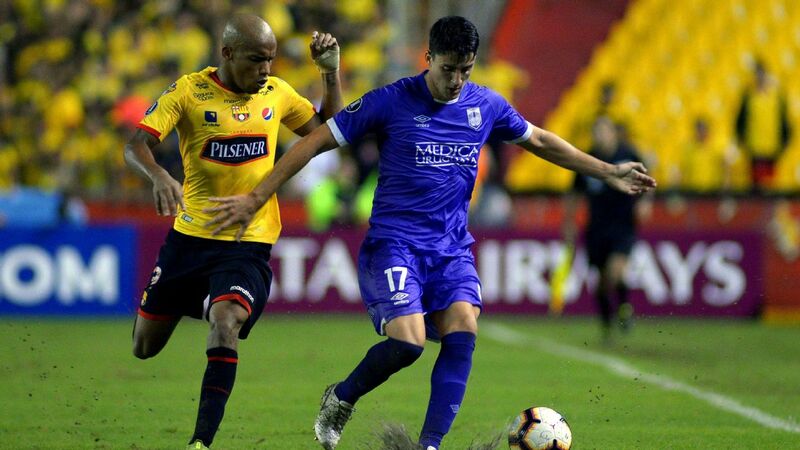 And in the previous round they needed a shootout to get past Emelec of Ecuador. Their fans had started to believe that their name was on the trophy. But this time their run came to an end. Lanus keeper Esteban Andrada stopped two of their penalties while his team were faultless -- and they now have more than a month to dream of a semifinal meeting with River Plate.